1983 in a normal American small town called Hawkins. 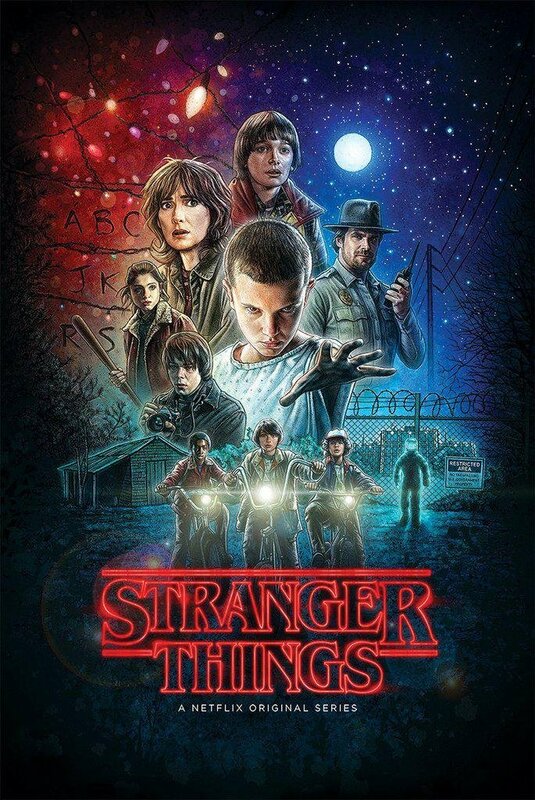 On the way home from a nicely nerdy night of playing Dungeons and Dragons in a cozy basement with his three best friends, twelve-year-old Will Byers (Noah Schnapp) encounters a strange thing and disappears without a trace. Will’s worried single mother Joyce Byers (Winona Ryder) turns to local Police Chief Jim Hopper (David Harbour) – a guy whose morning grooming ritual includes beer and cigarettes and who at first doesn’t take the case seriously. But Will’s friends Mike (Finn Wolfhard), Dustin (Gaten Matarazzo), and Lucas (Caleb McLaughlin) take matters like these seriously and into their own young hands. While searching for their missing friend, they encounter Eleven (Millie Bobby Brown), a mysterious girl with a shaved head and the number 11 tattooed on her arm. The trio will soon find out that these features are not the strangest things about the girl. This American small town with a secretive research lab nearby may not be so normal after all, and even a reluctant Chief Hopper comes to realizes that stranger things of a paranormal nature are afoot in Hawkins. The show will spellbind you just like the glowing bold letters of the title at the beginning of each episode do. And just like the bloodcurdling otherworldly being… No. Wait, revealing any further details would be too much of a spoiler. One thing I can reveal is that Stranger Things (2016 – present) has got ‘it.’ And I don’t mean the creepy clown from the Stephen King novel. It’s got a suspenseful plot with interesting and well-woven subplots, likeable characters, and magnificent actors. Most notably the youngest members of the cast – Noah Schnapp, Finn Wolfhard, Gaten Matarazzo, Caleb McLaughlin, and Millie Bobby Brown – succeed in portraying likeable and relatable characters. Absolutely heart-warming, but not kitschy. So funny, so often, but in natural and not cheap ways that don’t prevent us from taking them seriously. This is especially the case with Millie Bobby Brown’s mystery character, Eleven. The young British actress’s multifaceted performance is strong, intense, eerie, and tragic as her character develops, yet never over the top. Also, the show’s creators, the Duffer Brothers, have written dialogue for kids that actually sounds like kids speaking. Now, one frequent point of criticism is that many Stranger Things characters are too clichéd and not as well rounded as they could be. Granted, we have Will’s brother Jonathan Byers (Charlie Heaton), the outcast high school loner type who likes photography; Mike’s sister Nancy Wheeler (Natalia Dyer), the insecure wannabe cool girl princess type; and her oh-so-cool jock and party boyfriend, Steve Harrington (Joe Keery). However, I believe this criticism falls short. Firstly, because it fails to recognize that the initial setup of those rather clichéd characters doesn’t necessarily stem from bad writing but is more of a conscious act intended to mimic the style and feeling of horror movies from the show’s era. And secondly, because the characters do, in fact, evolve over the course of the two seasons. But there’s more to Stranger Things. Much more. And it’s hard to put into words because it’s an atmosphere, a feeling. It’s deeply tied to the decade the show is set in, that’s for sure. Reading the title of this review, you might ask yourself how ‘cozy’ and ‘horror’ go together, but that’s exactly what it is: ‘cozy horror.’ There is just something about the fashion, the background music, the technology, the cultural allusions, and the everything of the show that is strangely comforting and conducive to the bone-chilling suspense and horror. Netflix has recently announced that the 1980s will return in early 2019. For millions of fans, that’s a long wait for the third season. For anyone who hasn’t seen the show though, it’s an opportunity to catch up. But trust me, it’ll take far less than a year to watch two seasons of Stranger Things.